THE SOUND OF PURPLE is the new name of our band! We are still the same band MINUS our Jon Lord who has been replaced by keyboardist Sam McCaslin. Joining Sam are original band mates Stephen Austin Malanowski; (Ian Gillan) Lee Spencer; (Ritchie Blackmore) Ryan Krieger; (Ian Paice) and Kenn Tonn; (Roger Glover). THE SOUND OF PURPLE ROCKS!! 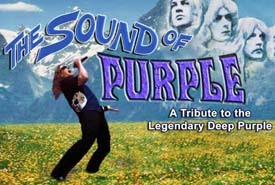 Any good cover band could play many of Deep Purple's songs, but there's a reason very few Deep Purple tribute bands exist: It requires musicians who were actually inspired by messieurs Jon Lord, Ritchie Blackmore, Roger Glover, Ian Gillan and Ian Paice to deliver a convincing performance that would leave people feeling like they are witnessing the REAL Deep Purple. It took 2 years of auditions to find the right musicians with the same lineage of influence as the Deep Purple musician they'd be portraying. Just being a good musician who could learn the parts wasn't good enough. Actually being inspired by Deep Purple was a must. That seemed like a task that would take literally forever... but in a much shorter time than ever imagined, we found Sam McCaslin, a very well traveled and seasoned musician; Stephen Austin Malanowski, a fellow Purple fanatic with the rare ability to sing in not just Ian Gillan's vocal style, but David Coverdale's as well; Lee Spencer, a Ritchie Blackmore-inspired guitarist who never strayed far from emulating the man over decades of performing; plus Kenn Tonn who not only looks like Roger Glover, but sounds just like him & plays like him complete with a Rickenbacker Bass; and Ryan Krieger, a seasoned musician who cites Ian Paice as one of his favorite drummers of all-time. Article: The Best Shows And Albums Of The Year! "These guys sound better than the real band does these days!" STEPHEN AUSTIN MALANOWSKI is a renowned classic rock vocalist, a master of all rock vocal styles and an intense performer. Born as one of six children (five boys and one girl) to Leon and Joan Malanowski, it is said that Steve came out singing a high note, and immediately began flirting with the nurses. He has performed at over 500 clubs throughout the East and West coasts and has appeared at several major Hollywood clubs, including Gazzari's, The Whiskey A-Go-Go, The Troubadour, FM Station, and many others. Steve has done U.S. tours opening for Santana, Elvin Bishop, NRBQ, Joe Cocker and Don McLean. Since his relocation, he has headlined all major venues in Las Vegas. He has been a staple at Fremont Street Experience for over three years, first with the tribute band Arena and now with The Sound of Purple, as well as his own band Rok of Ages. With his exceptional rock voice and his energetic stage presence, Steve is a captivating and engaging frontman and world class performer who builds strong bonds with the audience. Newest-member Sam McCaslin, who toured with The Michael Schenker Group, is a very well traveled and seasoned musician who not only will take the spot of John Lord and Don Airey on the keyboards and organ... but is a brilliant guitarist and singer as well...and the band plans to expand their repertoire a bit to take advantage of those things! More info on Sam is coming soon! Lee joined the band coming highly recommended by reknown engineer and producer, Brett Hansen. Under his former stage name, "Raven Storm," Lee recorded his first album in Brett's studio in 1992 called The Storm Project. Brett also handled the mixing and mastering of Lee's second record under the Storm Project name in 2001, which featured Dio/Black Sabbath drummer Vinny Appice, and was recorded over five years in numerous studios located in Las Vegas, London, Stockholm, and Uppsala. Lee was heavily influenced by Ritchie Blackmore from around the age of ten years old. It was Blackmore's image on the early Rainbow albums that had an especially large impact on Lee... usually being dressed in all-black and holding a contrasting Fender Strat. A VHS tape featuring all of the videos and live clips of several classic Rainbow songs solidified Lee's desire to develop a "Blackmore-esque" stage presence. Although Lee explored many different styles and played many diffferent guitars, that initial impression made more of an impact than he realized. He has found that it's not much of a stretch for him to "get into character." Although capturing the many different aspects of Blackmore's playing, he states, "...is a never-ending pursuit of an impossible goal. The most important thing is maintaining a high level of feeling, and never becoming mechanical. Ritchie Blackmore," he continues, "...had a very 'damn the mistakes' attitude in his playing... and capturing that while not straying too far off the path is very important. But it is also a very liberating and fun way to play." Kenn Tonn (pronounced Tone), began playing bass and singing at an early age in his home state of Alaska. He was heavily influenced by the great bassists of the 60's and 70's including John Paul Jones, Geezer Butler, Roger Glover, Mel Schacher, Sir Paul McCartney, Bill Wyman, Chris Squire, John Entwhistle, Noel Redding, and Jimi Hendrix... among others... and the sum of those influences can be heard in his style. Although his first love is hard rock, he also enjoys playing many genres and sub genres including blues, folk, funk, country, and jazz. It's been said he pours his heart and soul into playing the bass, no matter what the style. Kenn says "It's all music, I am just so happy to still be doing it after all this time." Born in Anchorage, Alaska, Kenn has played throughout the state, as well as all over the "lower 48" from San Diego to New York, down to the East coast of Florida, and several points in between. There are a couple of high profile gigs in Canada and Mexico thrown in the mix as well. He is proud of his achievements in the all-too-tough music business, but maintains a very laid back attitude among his peers and fans... although he brings an intense presence to every stage he performs on. Kenn is at home in front of crowds of ten to much more than 10,000, and has played in many bands, both cover and original. Many of those bands have performed in support of well-known international acts. Over the last several years, some of those bands include Jimi Hendrix tribute bands Jimi's Image and Mirror Imij, a Blues Brothers tribute band, and a popular AC/DC tribute called High Voltage. He has also been chosen to perform at Rock and Roll Fantasy Camp in Las Vegas, and has shared the stage with the likes of Oz Fox (Stryper), Frank Dimino (Angel), George Lynch (Dokken, Lynch Mob), Ace Frehley (KISS), Scott Coogan (Lynch Mob, Ace Frehley Band), John 5 (Rob Zombie, Marilyn Manson), Joe Vitale (Joe Walsh, CSNY, Meryl Streep) and Alice Cooper, to name a few. Ryan Krieger loves the fact that he gets to play like Ian Paice with The Sound of Purple. While growing up, Ryan was mesmerized by Ian's blazing fast hands and enormous presence on the drumkit and to this day he serves as a massive influence. Ryan has toured with several different artists for many years, honoring the distinction of sharing the stage with artists from Bruce Hornsby to Slayer. Tours include US and Europe with the Cro-Mags on their Revenge tour, several US tours with Jam-bands Dr. Didg and Global Funk, and touring in Japan with Harley's War. Along with these experiences and the undeniable influence of Deep Purple, Ryan truly delivers. He looks forward to rocking out with his brothers in The Sound of Purple and sharing the love for Deep Purple's music with all the fans.